Posted on: August 1st, 2017	by Jennifer A. In full disclosure, we were given passes to visit the Franklin Institute Mirror Maze exhibit. We appreciate their support of Jersey Family Fun and our efforts to share fun things to do in Philadelphia with our readers. When can math be aMAZing and fun? When it’s the theme behind the Franklin Institute Mirror Maze exhibit. Recently, I had the chance to visit with my 3 boys and husband. I really had no idea what we were in for. I thought the Mirror Maze would be just that – a maze with mirrors. I thought we’d find our way, or try to anyway, and then be on our way to another Franklin Institute exhibit. I was so wrong. The Mirror Maze is that but so much much more. 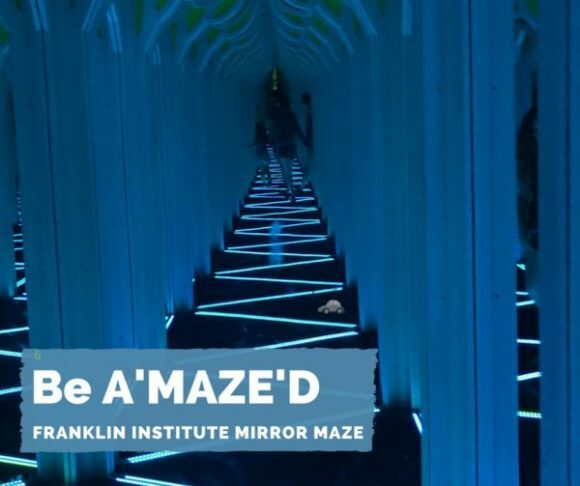 Why you will be aMAZEd at the Franklin Institute Mirror Maze exhibit! This is not your boardwalk fun house maze. 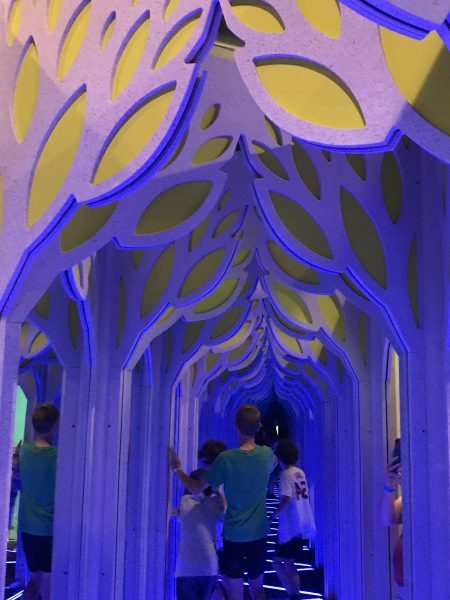 The Franklin Institute Mirror Maze is unlike any mirror maze my family and I have experienced. But you might not know that by just looking at it. Yes, the mirrors are full length with elaborate trim and rope lights that change color. It’s like walking through a 1700-square-foot mirror maze in the Taj Mahal. When my family and I went through the Mirror Maze the first time, we thought the objective was to just get out of the maze quickly. We were wrong! 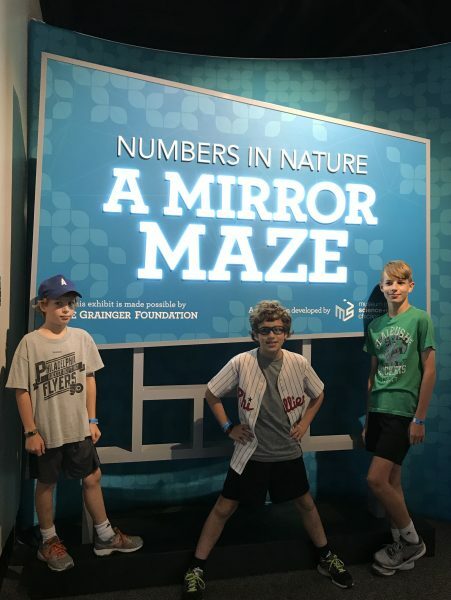 When I started to question the staff on how many mirrors are in the maze or what interesting facts could I share about the Franklin Institute Mirror Maze, that’s when I realized there is more to this Mirror Maze than meets the eye. Within some of the mirror walls are mind benders, brain teasers, and more. But if you rush through the maze you won’t find them or Pascal’s Triangle found in the center of the maze. Instead, take your time walking through the maze. 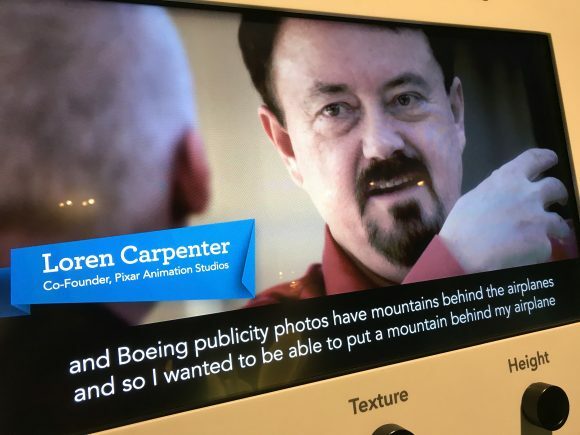 Step carefully on certain floor panels and occasionally you’ll be surprised with an image projected on the mirror, or objects that reveal themselves. You can see some of the examples we found in our Facebook album. 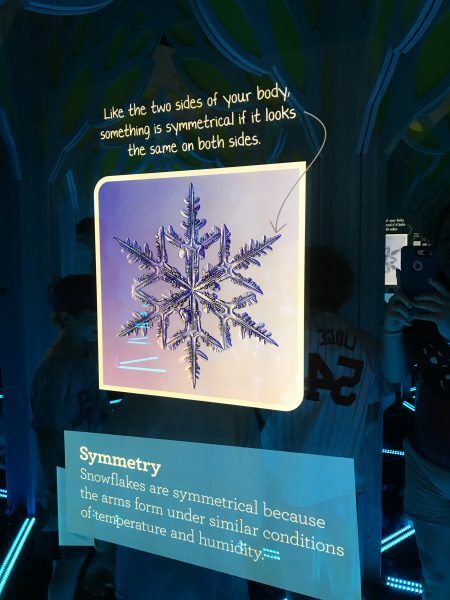 Before and after you enter the Franklin Institute Mirror Maze there are a multitude of displays showing us how math plays a role in nature, technology, and even our favorite Pixar movies. 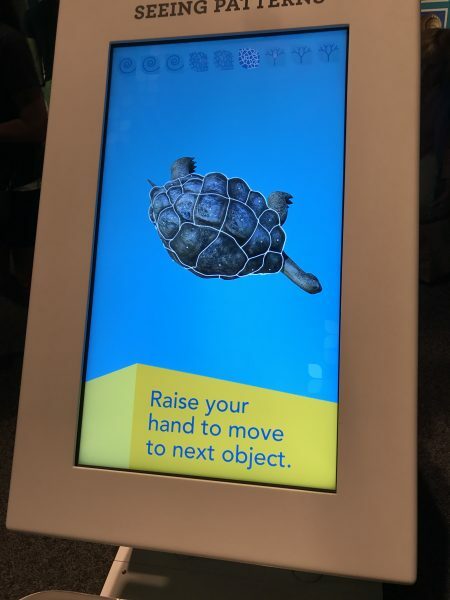 Several of the displays had us rethinking how we see the world through hands-on activities. We learned more about how there are patterns in everything from the spiral in a shell to the wings on a plane. Using our hands we were able to rotate turtles, leaves, a head of lettuce and other objects to look at the patterns that form them. We could see the turtle’s shell pattern from the top, bottom, and side. 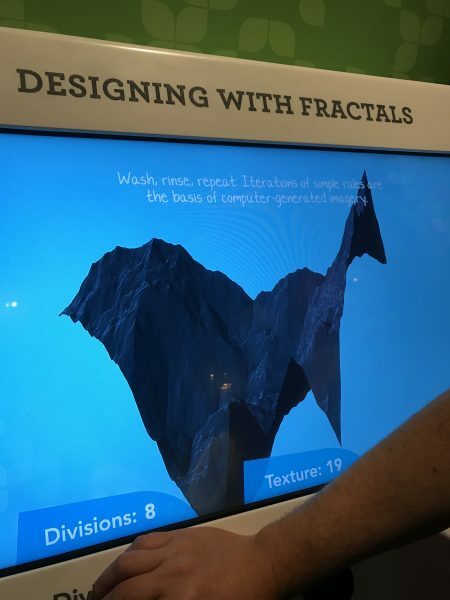 Using rotating dials we were able to design mountains with fractals, similar to how Pixar animation artists do. Other mirrors used lines and our bodies to determine our height and arm span. I always appreciate a fun way to get my boys excited about math and this was definitely that. I hope you’ll visit for your own aMAZing experience. Keep reading to learn more about our ticket giveaway running from August 1-14, 2017 for a chance to win four tickets to the Franklin Institute to see the Mirror Maze and other exhibits. Franklin Institute Mirror Maze exhibit will be open until September 4, 2017. Entrance to the exhibit is included with admission to the museum. There is a $5 additional charge per person for members. 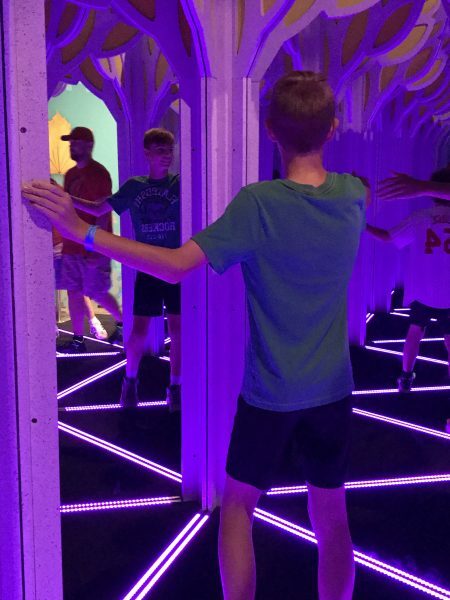 Please note: The Mirror Maze contains an LED lighting system that creates geometrical shapes through reflections and may affect photosensitive individuals. However, you can visit the exhibit and bypass the Mirror Maze to participate in the other activities. For more details about the Franklin Institute Mirror Maze, please visit the Franklin Institute website. The Franklin Institute is open from 9:30 AM – 7 PM daily for the summer. The last admission into Franklin Institute is at 6 pm. For more pictures from our visit to Franklin Institute in Philadelphia, see our Facebook Photo Gallery. 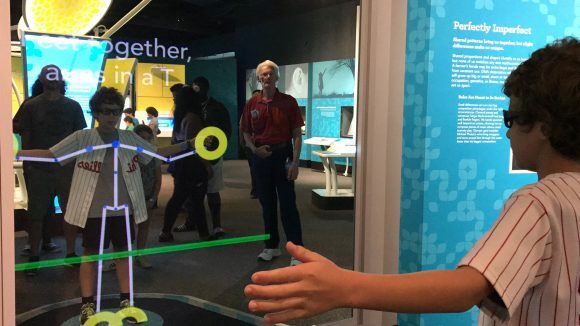 To learn more about the Franklin Institute visit our Franklin Institute series. Want to win a Family 4 Pack of Franklin Institute tickets?